Round eyes are those that are open and are widest in the middle. They're mostly comparable to a baby's eye. You can tell them apart mostly because of the dip they have on the bottom lash line. A great example is Katy Perry. The roundness is often even more pronounced than hers with a more drastic curve on that lash line. Eyebrow Shapes To Flatter or Flatten? There are two effects you can create with your brows. To emphasize the roundness of your eye, you can have a higher arch, and brows that become thinner at the ends. To make them less round, you have a straighter arch and an almost uniform thickness. This eye makeup complements the roundness of your eye. You're keeping them open, and just making them a little more striking. The best way to do this is to keep your colors neutral, and focus on the eyeliner. Place a light color on one half of the eye, and a darker one on the other. The half you choose can depend on the space between your eyes. Place the same dark color along the whole bottom lash to basically emphasize the whole round shape of your eye. How to Elongate Round Eyes? 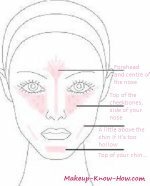 Since your eyes are already round, elongating them means skewing the round shape. So you will use eyeshadow and/or liner strategically to make them a little flatter. Use a horizontal pattern on the lid, and use eyeliner only on the top lid. When lining your eyes, first do the waterline. This will thicken those lashes and bring the lid down a little. It'll make it look a little heavier. Then line the lash line. Make the eyeliner as thick as you'd like,as long as it's even across the lid. If your lids are already heavy, you may want to give it a little bit of a brushing to blend it and make it softer. You can even wing it out for a little more linearity. If you want to use eyeliner on the bottom lid, use a brown one that won't emphasize that bottom lash line. If it's dark, it will define the bottom lash line and complete the circle. This will make take your eye back to looking round. So rather use a light eye liner, and fade it out into a soft shadow for even less definition.